I have an AW 17 R5. A couple days ago. I went to change the keyboard lights. Shortly after saving a theme all the lights went out/blacked out including my micro keys. Ive done the dells proper uninstall/reinstall of the AWCC, didnt work. Ive even factory reset my computer deleting everything but windows then did the proper dell install again, still doesnt work. Ive noticed everytime i change the type of keyboard lighting (Pulse, wave, color) that the default color auto switchest to black (R:0 B:0 G:0). Any ideas on what else i can do? Follow me on Twitter! https://twitter.com/jojorobino5312 Check out my 2nd channel with moore4u here! 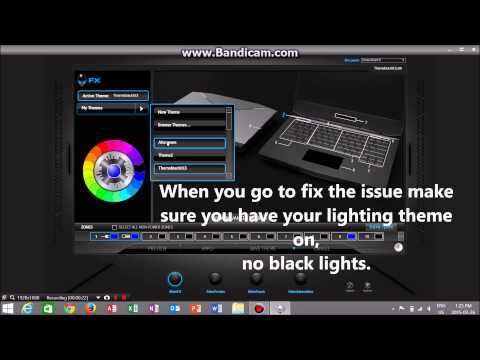 https://www.youtube.com/user/moorejojo5312 You: My Alienware lights aren't working! Me: Don't worry, I'll save you! Any ideas on how to get that toolbar app this guy goes to? My comptuer does not have it.